Susan’s not very good at answering the question “Hey baby… what do you want for Christmas?” That’s not a judgment, just a fact borne of the roughly 16 Christmases we’ve been together. Sure there were times when she knew EXACTLY what she wanted, such as that year she said without pause and I kid you not: “A rototiller!” But mostly when asked she typically shrugs. Concurrently I’m not at all very good at intuitively knowing what she might want. So on the day before this past Christmas Eve when we did an out and back through Echo Park for our regular pre-Christmas local shop/walk-around, one of the last places we popped into was a dark, dusty and rather dreary antique shop on the north side of Sunset Boulevard just west of the bend at Mohawk Street. 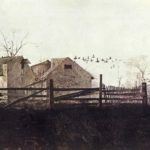 Nothing from the jumbled piles of stuff jumped out at me, but a framed print depicting a monochromatic farm-like setting of old buildings and birds and barren trees got Susan’s eye. She picked it up and gave it a good looking over. 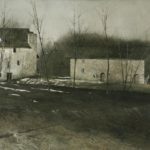 The proprietor offered “That’s a Wyeth. 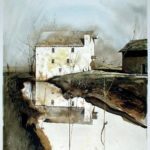 A lithograph.” Sure enough the signature in the bottom right read Andrew Wyeth. And when she asked how much, he said “$150.” At that pricepoint, she promptly set it back down and we were soon on our way. I mentioned how I’m not very intuitive, but I’m not a blob of gelatinous goo either. So when sometime later that day, Susan commented offhandedly that she really liked that picture, I knew what I had to do. And the next day I did. Loading myself up with enough cash to make a polite but firm and very fair counter offer I prayed the place was open on Christmas Eve, which it was. Marching straight back to the print I reminded the owner of our visit yesterday with the Wyeth and told him what I was willing to pay. He mulled it a moment, said OK and the transaction was complete. Susan was very pleased when she unwrapped it the next morning, and it has since found a home on the dining room side table. 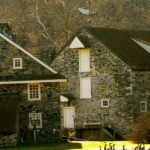 I wrote all that because it finally dawned on me that there might be a title to that work of art, and it only took some brief googling to find out it is called “The Mill,” most likely painted in 1958 around the time the Wyeths bought the property and subsequently restored it. 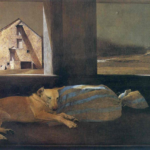 I found other paintings (more famously “Night Sleeper,” featuring Wyeth’s dog) that feature the location, known as Brinton’s Mill, built in 1720, in Birmingham Township, Chester County, Pennsylvania. This entry was posted on Sunday, January 21st, 2018 at 6:01 am and is filed under art, neighborhood, seasonal. You can follow any responses to this entry through the RSS 2.0 feed. Both comments and pings are currently closed.